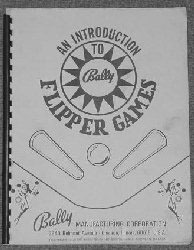 Manual for service/repair of Bally electro-mechanical (EM) pinball games that were made from about the mid-1960s through 1976. Approx. 50 pages. Reprint manual, new condition. Includes theory-of-operation and functional information that describes mechanisms inside the game and how they work. Includes parts diagrams, basic schematics (no game-specific schematics), and descriptions of devices used in these games- how they work, what they do, and how to service. A must if you are just getting started with Bally electro-mechanical games. This manual does not include any game-specific schematics. Search our site by game name to see if we carry schematics that are specific to your game. This manual is not a step-by-step "how to" guide for repair, meaning it will not tell you how to solve specific individual problems that your game may be having. Instead, it describes how the devices in your game function, and you then use that information to do your own troubleshooting and repair.